Eunyong Park and his research group are interested in understanding molecular mechanisms of protein translocation—transport of polypeptides across lipid membranes. One of hallmarks of eukaryotic cells is the presence of membrane-bound intracellular organelles, such as endoplasmic reticulum, mitochondria, and peroxisomes. These organelles compartimentalize specific proteins and biological molecules within to perform their distinctive cellular functions. Like other cytosolic proteins, almost all proteins residing in these organelles are first synthesized by cytosolic ribosomes. However, to enter their specific organelle, they need to move across the organelle’s membrane. About a half of cellular proteins requires such protein translocation before they reach their destination where they perform function. Dysfunction of these translocation processes leads to protein aggregation and cellular stresses. To understand the molecular mechanisms of protein translocation, the Park group combines biochemical and structural approaches, including cryo-electron microscopy. They focus on protein-conducting channels, membrane-bound protein complexes forming a water-filled pore to allow hydrophilic polypeptides to move across the hydrophobic lipid membrane. Dr Tom Rapoport at Harvard Medical School. Prior to joining the faculty at UC Berkeley in 2018, he was a Jane Coffin Childs postdoctoral fellow with Dr Roderick MacKinnon at the Rockefeller University. There he studied the mechanisms of CLC-type chloride ion channels using structural and biophysical approaches. 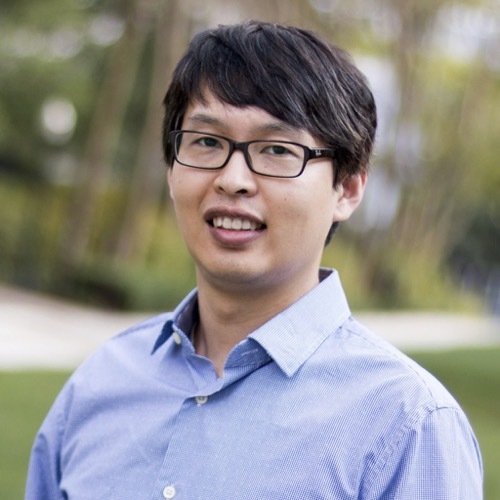 Eunyong is a recipient of 2014 ASCB Kaluza Award and 2017 Blavatnik Awards (finalist).